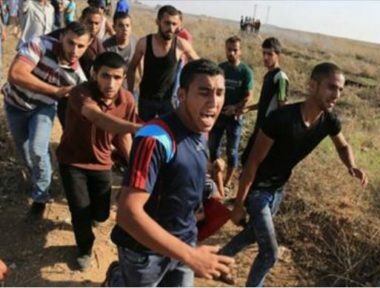 Israeli soldiers shot, on Thursday evening, six young Palestinian men with live fire, and caused many to suffer the effects of teargas inhalation, during nonviolent protests east of Rafah, in the southern part of the Gaza Strip. The soldiers stationed in military posts hundreds of meters across the perimeter fence, fired live rounds, rubber-coated steel bullets and high-velocity gas bombs at the protester on their lands, media sources said. The Palestinian Health Ministry in Gaza has confirmed that the soldiers shot fivePalestinians with live fire, and one with a gas bomb in his face. It added that dozens of Palestinians suffered the effects of teargas inhalation.